TLRs are primary sensors of both innate and adaptive immune systems, where they play a pivotal role in the response directed against structurally conserved components of pathogens. Synthetic bacterial lipopeptide Pam3CSK4 is a TLR2 agonist capable of modulating Th1 and Th2 responses. 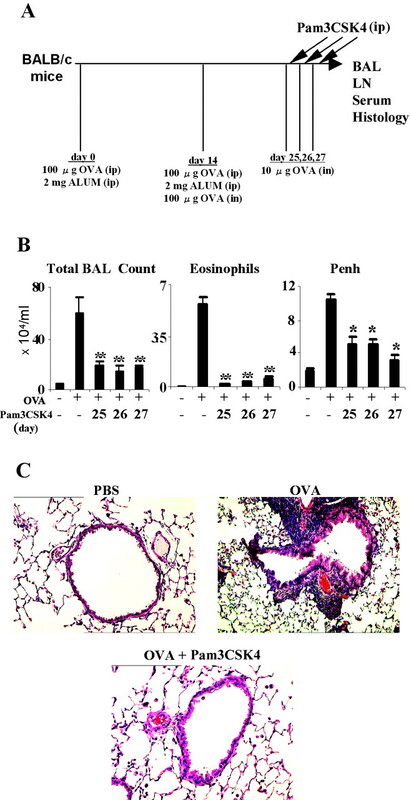 This study examines the therapeutic effect of Pam3CSK4 in established airway inflammation in a murine model of asthma. In mice previously sensitized and challenged with OVA, Pam3CSK4 given i.p. markedly reduced the total inflammatory cell infiltrate and eosinophilia in bronchoalveolar lavage fluid. Pam3CSK4 therapy was associated with a reduction in OVA-induced IL-4 and IL-5 secretion from thoracic lymph node culture, airways inflammation, bronchial hyperresponsiveness, and serum levels of IgE. Pam3CSK4 therapy was also associated with an increase in OVA-induced IFN-γ, IL-12, and IL-10 production. 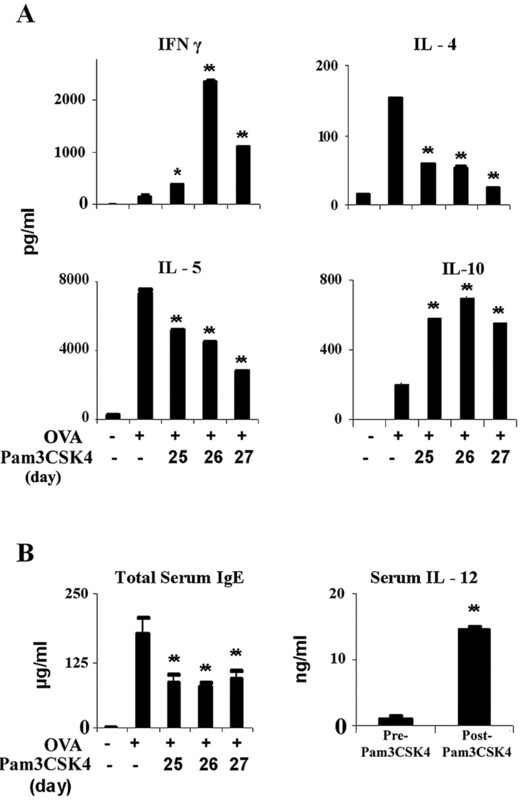 However, the anti-inflammatory effect of Pam3CSK4 was independent of IL-10 or TGF-β, but was critically dependent on IL-12, the production of which by dendritic cells was enhanced by Pam3CSK4 in vitro. Our results provide direct evidence that Pam3CSK4 could represent a novel therapeutic agent in allergic airways disease. Asthma is a chronic inflammatory condition of the airways characterized by airways hyperresponsiveness (AHR),3 inflammatory infiltrates in the bronchial wall containing eosinophils, and elevated serum IgE levels. Th2 lymphocytes are thought to play a key role in the initiation and perpetuation of this airway inflammation (1, 2, 3). The prevalence of asthma and allergies has increased dramatically over the last 20 years in developed countries, which cannot be explained by changes in genetic predisposition. Environmental factors, especially in industrialized countries, are now thought to be responsible for this rapid increase in asthma (4, 5). Respiratory infections have been linked to asthma in both a preventative and an exacerbating role (4, 5). Hence, investigating the system that initially recognizes the respiratory tract pathogens seems imperative to understanding this inflammatory disease. TLRs are pattern recognition receptors that act as primary sensors of microbial products. There are now 10 TLRs identified in humans, found in both the innate and the adaptive immune system, where they play a pivotal role in the response directed against distinct, structurally conserved components of pathogens (6, 7). Administration of low dose intranasal LPS in a murine model of asthma resulted in an increase in the Th2-mediated allergic phenotype, which is dependent on TLR4 (8). Immunomodulatory oligodeoxynucleotides and LPS can reduce allergic inflammation in experimental models of asthma via the activation of TLR9 and TLR4, respectively (8, 9, 10). To date, TLR9 is the only TLR that has been shown to reverse established airway inflammation in both acute and chronic murine models of asthma (10, 11). Recently, it has been demonstrated that TLR2 polymorphism is a major determinant of the susceptibility to asthma and allergies in children of farmers in Germany (12). TLR2 recognizes microbial components by forming a heterodimer with TLR1 or TLR6 (13), and previous studies have examined the effect of the TLR2 agonists synthetic bacterial lipopeptide (Pam3CSK4) and peptidoglycan (PGN) in murine models of asthma. The results were contradictory. When administered during the sensitization period, early TLR2 agonist treatment was reported to worsen Th2-mediated asthma (14, 15). In contrast, TLR2 activation immediately before the intranasal challenge was found to reduce allergic airways inflammation (16). It is important to note, however, that although PGN was thought to activate the TLR2/6 heterodimer, recent work suggests that lipoprotein and lipoteichoic acid contamination of PGN may be responsible for its TLR2 activation (17). All studies to date have examined TLR2 activation before the airway challenge in these models (14, 15, 16), and none has examined the therapeutic potential of TLR2 agonists in established inflammation. We have investigated the therapeutic effect of the synthetic TLR2 agonist, Pam3CSK4, on established airways inflammation. We report in this study that Pam3CSK4 profoundly attenuated an established OVA-specific asthma in mice. This therapeutic effect was critically dependent on IL-12, but not IL-10 or TGF-β, and was accompanied by an enhanced specific IFN-γ-producing Th1 response. Our data therefore provide direct evidence that Pam3CSK4 or other TLR2 agonists could have potential as a new treatment of clinical asthma. The BALB/c mice (Harlan-Olac) used were 6- to 8-wk-old females. DO11.10 mice, transgenic for TCR specific to OVA peptide (sequence 323–339), were on a BALB/c background. IL-12 p40 knockout (KO) mice were supplied by Prof. A. M. Mowat (University of Glasgow, Glasgow, U.K.) and were also on a BALB/c background. All mice were kept at the Biological Services facilities of University of Glasgow according to the U.K. Home Office guidelines. Synthetic bacterial lipopeptide Pam3CSK4 (EMC Microcollections), PGN (Sigma-Aldrich), OVA (fraction V; Sigma-Aldrich), and rat or rabbit IgG (Sigma-Aldrich) were all prepared in sterile PBS (Invitrogen Life Technologies). Avertin solution was 1,1,1-tribromoethanol (Sigma-Aldrich) dissolved 1/1 (w/v) in amyl alcohol (Sigma-Aldrich), then diluted 1/40 in PBS. The alum suspension was 2% Alhydrogel (Brentag Biosector). Anti-IL-10R was provided by Dr. K. Moore (DNAX). Anti-IL-12 was a polyclonal rabbit anti-mouse IgG Ab prepared from clone Rab74.6, and anti-TGF-β mAb was prepared from clone 1D11.16 (both from American Type Culture Collection). Airway eosinophilia was elicited by a modified protocol (18). Mice were immunized i.p. on days 0 and 14 with 100 μg of OVA in an alum suspension made up to a volume of 200 μl. On day 14, mice were anesthetized with 250 μl of avertin, and 100 μg of OVA in 40 μl of PBS was administered intranasally (i.n.). Mice were again anesthetized before being challenged i.n. on each of days 25, 26, and 27 with 10 μg of OVA in 40 μl of PBS. Control mice were given PBS in place of OVA in both sensitization and challenge stages. Enhanced pause (Penh; EMMS) was measured at 12.5–50 mg/ml methacholine on day 28, as previously described (19). Mice were killed on day 29 by administration of a fatal dose of avertin. To test the effect of TLR2 agonist, a single dose of Pam3CSK4 (100 μg) was administered i.p. on day 25, 26, or 27, 2 h after the i.n. OVA challenge. In some experiments, anti-IL-12, anti-IL-10R, anti-TGF-β or rat/rabbit IgG control was administered i.p. (1 mg/200 μl of PBS/mouse) on day 27 together with Pam3CSK4 treatment, 2 h before i.n. OVA challenge. Immediately after the administration of a fatal dose of avertin, a blood sample was collected by cardiac puncture. BAL was then harvested using two aliquots of 0.8 ml of PBS. The lavage samples from individual mice were kept on ice until processing. The BAL was centrifuged at 1400 rpm for 5 min, and the supernatant was removed. The volume of each supernatant was measured before storage at −70°C until assayed for cytokines. The BAL cell pellet was then resuspended in 1 ml of PBS and counted using a hemocytometer (Weber Scientific). Cytospin preparations were made using a Cytospin (Shandon) and were stained with Diff-Quick (Triangle Biomedical Sciences) in a rapid Romanowsky staining method. Differential cell counting was performed using standard morphological criteria. After BAL sampling, the lungs were removed and inflated with 1 ml of 10% neutral-buffered formalin, then fixed in 10% neutral-buffered formalin for 72 h. The left lung was dissected free and embedded in paraffin. Sections (6 μm) were stained with H&E and examined under ×20–100 magnification, and peribronchial and perivascular inflammation was assessed. Thoracic lymph nodes and spleens were harvested, and single-cell suspension was cultured in RPMI 1640 medium supplemented with 2 mM l-glutamine, 100 IU/ml penicillin, 100 μg/ml streptomycin, 50 mM 2-mercaptopurine, and 10% heat-inactivated FCS (all from Invitrogen Life Technologies). Cells were cultured at 2 × 106 cells/ml with 1 mg/ml OVA for 96 h in triplicate in U-bottom, 96-well plates (Nunc). Supernatants were analyzed for cytokine concentrations by ELISA. T cell proliferation was determined by [3H]thymidine incorporation at 72 h.
BMDCs were generated as described previously (20, 21). The cells were cultured at 2 × 105 cell/ml with 0.3 μM OVA323–339 peptide and Pam3CSK4 (10 or 100 μg/ml) for 12 h. Supernatants were collected and stored at −70°C for cytokine analysis. The residual cells were then washed and cultured with 1 × 106 CD4+ T cells, 0.3 μM OVA323–339 peptide, and Pam3CSK4 (10 or 100 μg/ml) for an additional 12 h. T cells were purified from the lymph nodes of OVA TCR transgenic (DO11.10) by negative selection using magnetic beads (MACS; Miltenyi Biotec) (22). Supernatants were collected and stored at −70°C for cytokine analysis. Murine IL-4, IL-5, IL-12, IFN-γ (BD Biosciences), and IL-10 (BioSource International) were assayed using paired Abs. The lower limit of detection for IL-4, IL-5, IL-10, and IL-12 was 10 pg/ml, and that for IFN-γ was 40 pg/ml. Total serum IgE was measured using an OptEIA ELISA kit (BD Biosciences); the lower limit of detection was 6 ng/ml. ANOVA was used to compare differences between multiple groups. Statistical significance between individual groups was then examined by Student’s t test. A value of p < 0.05 was considered significant, and p < 0.01 was deemed highly significant. To investigate the therapeutic potential of Pam3CSK4 in reversing inflammation in allergic asthma, we used an OVA-induced murine asthma model. BALB/c mice were primed and boosted with OVA as described in Materials and Methods. All mice were challenged i.n. on 3 consecutive days beginning on day 25. Pam3CSK4 (100 μg/mouse) was administered i.p only once on day 25, 26, or 27. Pam3CSK4 was given 2 h after challenge (Fig. 1⇓A). Thus, mice treated with Pam3CSK4 on day 27 alone would have been challenged on the previous 3 days with OVA. Untreated OVA-sensitized and -challenged mice produced the expected airway hypersensitivity. Pam3CSK4 treatment showed a profound reduction in the BAL total cell count, eosinophilia, and Penh value (Fig. 1⇓B). 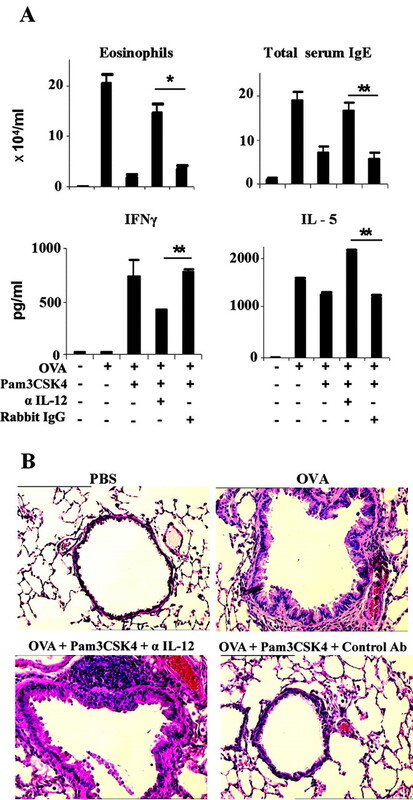 Histological analysis demonstrated a reduction in the inflammatory infiltrates in the peribronchial and perivascular areas of the murine lungs treated with Pam3CSK4 (Fig. 1⇓C). This decrease in airway hypersensitivity was observed on all days that Pam3CSK4 was administered. Even mice that had received all three i.n. OVA challenges showed a profound decrease in airways inflammation when Pam3CSK4 was administered 2 h after the last i.n. allergen dose (see day 27 data). This beneficial effect of Pam3CSK4 was sustained for at least 5 days after treatment (data not shown). These results demonstrate that Pam3CSK4 could be a novel therapeutic agent for established asthma. The dose of Pam3CSK4 used was determined by in vivo titration. Although 25 μg of Pam3CSK4 was found to significantly reduce airway hypersensitivity, 100 μg consistently produced highly significant attenuation of AHR (data not shown). Hence, 100 μg was selected for all subsequent experiments. Pam3CSK4 has a therapeutic effect on established allergic airways disease. A, Experimental protocol. BALB/c mice were injected i.p. with 100 μg of OVA and 100 μl of 2% alum on days 0 and 14. The mice were boosted i.n. with 100 μg of OVA on day 14. All mice were then challenged i.n. on 3 consecutive days, beginning on day 25. Pam3CSK4 (100 μg/mouse) was administered i.p only once on day 25, 26, or 27. Pam3CSK4 was given 2 h after challenge. Penh was determined on day 28, and mice were killed on day 29. Serum, BAL, and lymphoid cells were collected, and lung histology was studied. B, Total BAL cell concentration and eosinophil proportion fell markedly after Pam3CSK4 therapy. Even mice given three i.n. challenges (on days 25–27) and then given one dose of Pam3CSK4 2 h after the last i.n. challenge demonstrated a highly significant fall in their BAL indices (∗∗, p < 0.01 compared with mice given OVA alone). The Penh after a 2-min nebulization with 50 mg/ml methacholine shows decreased AHR in bacterial lipopeptide Pam3CSK4-treated mice (∗, p < 0.05). Lung cytokines were not detected. Data are the mean ± SEM (n = 10) and are representative of four independent experiments. C, H&E sections of lungs (×20 magnification) demonstrate that airways inflammation was completely ameliorated by Pam3CSK4 therapy. The pictures (day 26) are representative of 10 mice per group. To investigate the immunological mechanism involved in Pam3CSK4 treatment, lymphoid cells were harvested from the Pam3CSK4-treated and untreated control mice and cultured with OVA in vitro. Pam3CSK4 did not affect T cell proliferation against OVA in vitro (data not shown). However, lymphoid cells from Pam3CSK4-treated, OVA-sensitized/challenged mice produced significantly more IFN-γ and IL-10 compared with those from untreated, OVA-sensitized/challenged mice (Fig. 2⇓A). In contrast, Pam3CSK4 treatment led to a marked reduction in IL-4 and IL-5 synthesis by lymphoid cells from OVA-sensitized/challenged mice. Serum obtained from mice after Pam3CSK4 treatment showed a marked reduction in the concentration of total IgE Ab. OVA-specific IgE also demonstrated a decrease after Pam3CSK4 therapy (data not shown). The level of serum IL-12 was greatly increased (up to 15 ng/ml) as early as 2 h after Pam3CSK4 injection (Fig. 2⇓B). Thus, there appears to be a skewing of the Th2 to Th1 response immediately after Pam3CSK4 treatment. Pam3CSK4-treated mice produced enhanced Th1 and reduced Th2 responses. Mice were described in Fig. 1⇑. A, Lymph node cells were harvested on day 29 and cultured with 1 mg/ml OVA in vitro as described in Materials and Methods. Culture supernatant was collected at 96 h, and cytokine concentrations were assayed by ELISA. Data are the mean ± SEM (n = 5) and are representative of three experiments. B, Sera were collected 2 h after Pam3CSK4 treatment on day 27. Pam3CSK4 treatment led to a marked reduction in total IgE (∗∗, p < 0.01 compared with untreated control) but highly enhanced IL-12 synthesis (up to 15 ng/ml). OVA-specific IgE showed a similar reduction after Pam3CSK4 treatment (data not shown). Data are the mean ± SEM of individual mice (n = 6–8). To investigate the cell source and mechanism by which Pam3CSK4 induced IL-12 production and Th1 cell development, we cultured BMDCs with graded doses of Pam3CSK4 in vitro. In response to Pam3CSK4, BMDCs produced significant levels of IL-12 (Fig. 3⇓A). IL-10, IFN-γ, IL-4, and IL-5 were not detected in any appreciable amount (data not shown). The cells were then washed and cultured with highly purified CD4+ T cells from OVA-TCR transgenic mice (DO10.11) in the presence of OVA peptide. CD4+ T cells cultured in the presence of BMDCs and Pam3CSK4 produced significant IFN-γ, but little or no detectable IL-4 (Fig. 3⇓B). These results demonstrate that Pam3CSK4 is capable of inducing DCs to produce IL-12, which, in turn, enhanced the development of Th1 cells and the production of IFN-γ. Pam3CSK4 enhanced IL-12 production by DCs and IFN-γ synthesis by T cells in vitro. A, BMDC were cultured with 10 or 100 μg/ml Pam3CSK4 for 12 h. Cytokine concentrations in the culture supernatant were assayed by ELISA. No cytokine was detected in the cultures without Pam3CSK4. In the presence of Pam3CSK4, BMDC-produced IL-12. IL-10, IFN-γ, IL-4, and IL-5 were not detected. B, CD4+ T cells were purified from DO11.10 mice and cultured in a 5:1 ratio with BMDC in the presence of OVA peptide and Pam3CSK4 for 72 h. Cytokine concentrations in the culture supernatant were assayed by ELISA. Pam3CSK4 enhanced IFN-γ, but not IL-4, synthesis. Data are the mean ± SEM (n = 3) and are representative of three experiments. We then investigated the role of IL-12 in the therapeutic effect of Pam3CSK4. Mice were sensitized and challenged with OVA as described above and injected i.p. with anti-mouse IL-12 or control rabbit IgG 2 h before i.n. challenge on day 27. Pam3CSK4 was administered 2 h later. Fig. 4⇓ shows that the therapeutic effect of Pam3CSK4 was completely abrogated by anti-IL-12 Ab. This was clearly demonstrated by the reversal of eosinophilia and IgE, IFN-γ, IL-4, and IL-5 synthesis (Fig. 4⇓A). 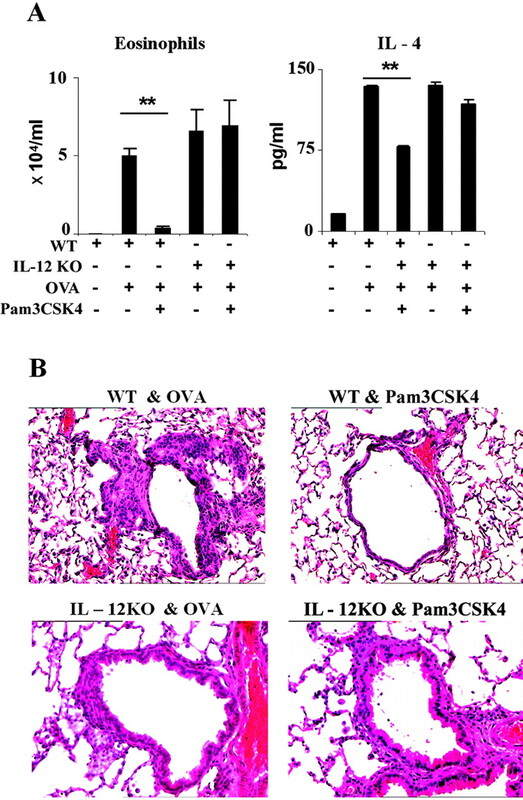 Mice injected with anti-IL-12 Ab showed lung inflammatory cellular infiltration indistinguishable from that of mice sensitized, but untreated with Pam3CSK4 (Fig. 4⇓B). To confirm the role of IL-12 in this model, we sensitized and challenged IL-12 KO mice with OVA and treated them with Pam3CSK4 as described above. Although wild-type control mice showed the expected beneficial effect of Pam3CSK4 treatment, IL-12 KO mice did not (Fig. 5⇓). 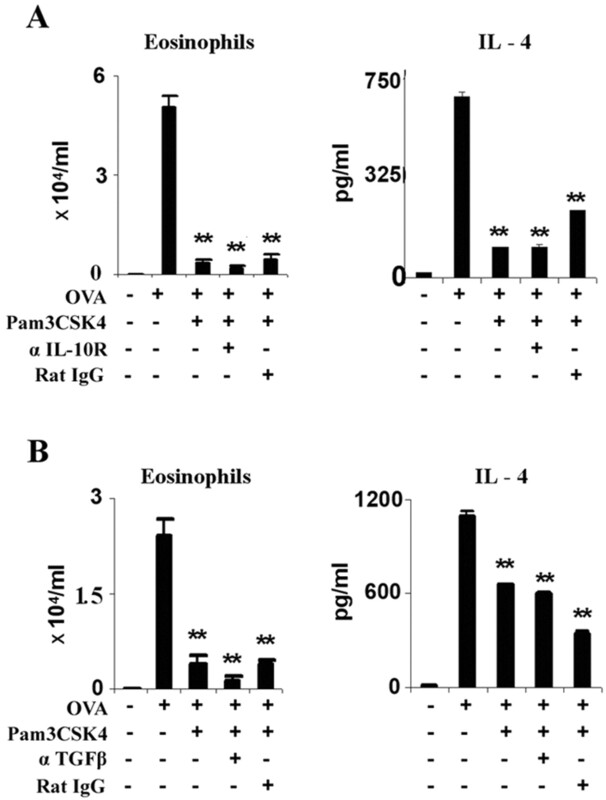 IL-12 KO mice exhibited the same degree of eosinophilia and IL-4 synthesis (Fig. 5⇓A) and lung cellular infiltration (Fig. 5⇓B) as the untreated IL-12 KO or wild-type mice. These results therefore clearly demonstrate that the therapeutic effect of Pam3CSK4 in asthma is critically dependent on the preferential induction of IL-12. The therapeutic effect of Pam3CSK4 was blocked by anti-IL-12 Ab. A, Mice were sensitized and challenged as described in Fig. 1⇑. They were injected i.p. with 1 mg of anti-IL-12 Ab or control normal rabbit IgG 2 h before the last (day 27) i.n. OVA challenge. Pam3CSK4 was administered i.p. 2 h after challenge. Anti-IL-12 Ab reversed the effect of Pam3CSK4 on the eosinophilia, IgE, IFN-γ, and IL-4 profile of the mice. Data are the mean ± SEM (n = 8). B, Lungs were harvested and fixed, and histology was examined as described in Fig. 1⇑. Anti-IL-12 Ab completely reversed the therapeutic effect of Pam3CSK4. Data are representative of eight mice per group. Pam3CSK4 had no therapeutic effect in IL-12-deficient mice. A, Wild-type or IL-12 KO mice were sensitized and challenged as described in Fig. 1⇑A. Pam3CSK4 was administered i.p. on day 27, 2 h after the last i.n. OVA challenge. Pam3CSK4 had no effect on the eosinophilia or IL-4 synthesis by lymphoid cells of IL-12 KO mice. IFN-γ was not detectable in the culture of cells from IL-12 KO mice. Data are the mean ± SEM of five mice. B, Histology examination of the lungs clearly demonstrated that Pam3CSK4 did not prevent inflammatory cell infiltrations in IL-12 KO mice. Data are representative of five mice per group. The enhancing effect of Pam3CSK4 on IL-10 production in vivo and in vitro suggests a potential role of regulatory T cells in the beneficial outcome of Pam3CSK4 treatment. IL-10 and TGF-β have been implicated as the effectors of several subclasses of regulatory T cells (23, 24, 25, 26). To investigate this possibility, mice were sensitized and challenged with OVA in the standard protocol. The animals were injected i.p with anti-mouse IL-10R Ab, anti-TGF-β Ab, or control normal IgG 2 h before i.n. OVA challenge on day 27. Pam3CSK4 therapy (day 27) was administered 2 h after the last i.n. challenge. These Abs and the amounts administered are routinely found to be effective in abrogating CD4+CD25+ regulatory T cells in our own laboratory (26). 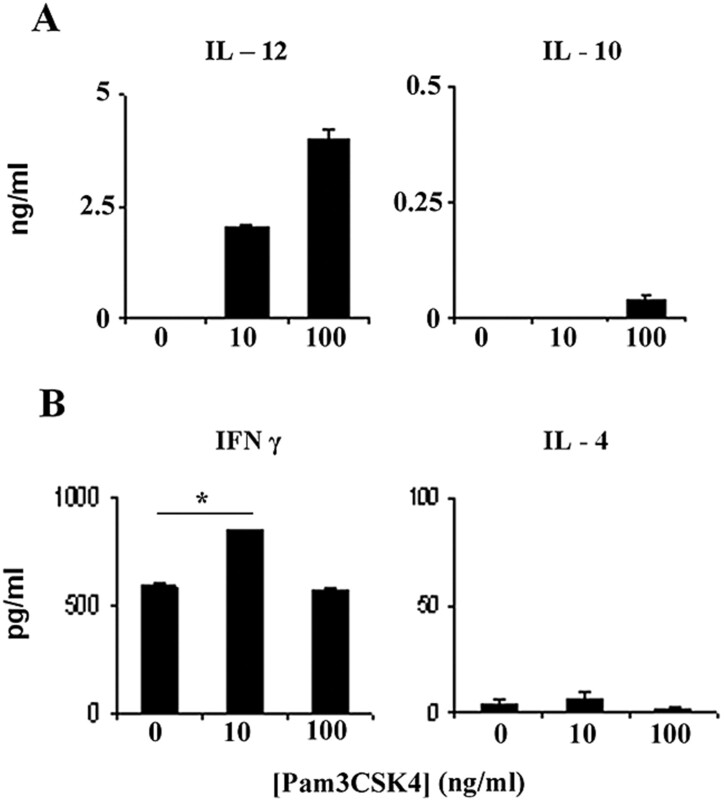 Neither anti-IL-10R Ab nor anti-TGF-β Ab had any effect on BAL cell counts, eosinophilia, OVA-induced cell cytokine production by lymphoid cells, or inflammatory cell infiltrate in the lungs (Fig. 6⇓). These results indicate that the therapeutic effect of Pam3CSK4 in airway hypersensitivity observed is unlikely to be mediated by regulatory T cells. Mice were sensitized and challenged as described in Fig. 1⇑A. Some mice were injected i.p. with 1 mg of anti-IL-10R Ab (A), anti-TGF-β Ab (B), or isotype-matched normal control IgG as indicated. The Abs were given 2 h before the last i.n. OVA challenge on day 27. Pam3CSK4 (100 μg/mouse) was injected i.p. 2 h after the challenge. Neither anti-IL-10R Ab nor anti-TGF-β Ab affected the therapeutic outcome of Pam3CSK4 treatment. Data are the mean ± SEM (n = 8). Our study demonstrates an impressive therapeutic role of Pam3CSK4 in a murine asthma model. The beneficial effect was immediate and sustained. The effect of Pam3CSK4 appears to be based at least in part on its ability to induce IL-12 synthesis by DCs. The heightened levels of IL-12, in turn, enhance a specific Th1 response and decrease Th2 activity. The therapeutic effect is independent of IL-10 and TGF-β and, by extension, is unlikely to involve regulatory T cells. In a human study it has been shown that IL-12 administration could reduce blood and sputum eosinophilia, but did not significantly change AHR (27). It is known that both IFN-γ and IL-12 can reverse Th2-mediated AHR and inflammation in murine models of allergic airways inflammation (28). However, it has also been reported that high levels of IFN-γ and IL-12 could promote established Th2-induced eosinophilic inflammation, and that a strong Th1 response (independent of Th2 involvement) could induce AHR (29, 30, 31). This is perhaps not surprising, because at high concentrations, IFN-γ is a well-recognized proinflammatory cytokine in its own right. In as much as Th2 cytokines are a dominant detrimental feature in airways diseases, the key therapeutic approach is perhaps to achieve a balance between Th2 and Th1 cytokines, where there is a decrease in Th2 cytokines without a large increase in the Th1 response. The role of TLR2 signaling in the induction of Th1 and Th2 cell development remains controversial. TLR2 activation has been reported to lead to the initiation of both Th1 and Th2 differentiation (15, 32, 33). It is likely that whether TLR signaling activates the Th1 or the Th2 pathway depends on the timing (relative to specific antigenic stimulation), dose, and nature of TLR2 agonists and the genetic background of the responding hosts. In our model, although there is a mild increase in Th1 cytokines, the levels do not appear to be high enough to exacerbate AHR or increase the Th1-dominant IgG2a Ab subtype (data not shown). Recent reports investigating the effect of TLR2 agonists in the sensitization phase and the effect of a TLR2/4 agonist in the challenge phase of murine models of asthma have also shown that TLR activation could lead to a beneficial decrease in the Th2 phenotype, with a mild nondetrimental increase in the Th1 response (34, 35). The effect of Pam3CSK4 was rapid. AHR attenuation was evident 24 h after i.p. administration. This was accompanied by a rapid reduction in the serum IgE level, which was also reported by other investigators (11). The mechanism of this rapid IgE reduction is unclear. However, it should be noted that the half-life of rodent serum IgE can be as short as 12 h (36, 37). The i.p. route used in our study was designed to influence the systemic immunological response and to avoid a potential local proinflammatory effect of Pam3CSK4 on other cell types, including macrophages, neutrophils, mast cells, and NK cells. Indeed, we have found that i.n. inoculation of Pam3CSK4 in our model consistently exacerbated AHR (data not shown). Experiments are currently being designed to address the mechanism of the disease-exacerbating effect of i.n. Pam3CSK4. The enhancing effect of Pam3CSK4 on IL-10 production raised the possibility that regulatory T cells may play a role in the beneficial outcome of Pam3CSK4 treatment. Many investigators have observed that the function of regulatory T cells (CD4+CD25+, Tr1, and Th3) is dependent on IL-10 and TGF-β (23, 24, 25, 26). It is also known that regulatory T cells express TLRs, and their suppressive function can be enhanced by TLR activation (38, 39). Using blocking Abs, we demonstrate in this study that the anti-inflammatory effect of Pam3CSK4 is independent of IL-10 or TGF-β, and hence, regulatory T cells are unlikely to play an important role in the therapeutic effect of Pam3CSK4. The beneficial effect of Pam3CSK4 and its mechanism of action appear to be akin to those of the TLR9 agonist, CpG oligonucleotides. TLR9 activation also led to an increase in IL-12 production by DCs and an enhancement of IFN-γ synthesis by T cells, resulting in decreased Th2 cell differentiation and attenuated eosinophilic airways inflammation (11). However, it has been reported that CpG could enhance the risk of aggravation of autoimmune disorder in immunocompetent hosts (40). Thus, TLR2 agonists, such as synthetic Pam3CSK4, may represent additional and alternative potential reagents for controlling allergic diseases. We thank Iona Fraser (Division of Immunology, Infection, and Inflammation, University of Glasgow, Glasgow, U.K.) for technical assistance and Roderick Ferrier (Department of Pathology, Western Infirmary, Glasgow, U.K.) for assistance with the preparation of lung histology. ↵1 This work was supported by the Medical Research Council, the Wellcome Trust, the National Asthma Campaign, the European Commission, and the Scottish Chief Scientist’s Office. ↵3 Abbreviations used in this paper: PGN, peptidoglycan; AHR, airways hyperresponsiveness; BAL, bronchoalveolar lavage; BMDC, bone marrow-derived DC; DC, dendritic cell; i.n., intranasally; KO, knockout; Penh, enhanced pause. Robinson, D., Q. Hamid, S. Ying, A. Tsicopoulos, J. Barkans, A. Bentley, C. Corrigan, S. Durham, A. Kay. 1992. Predominant TH2-like bronchoalveolar T-lymphocyte population in atopic asthma. N. Engl. J. Med. 326: 298-304. Barnes, P. J., K. F. Chung, C. P. Page. 1998. Inflammatory mediators of asthma: an update. Pharmacol. Rev. 50: 515-548. Holt, P. G., C. Macaubas, P. A. Stumbles, P. D. Sly. 1999. The role of allergy in the development of asthma. Nature 402:(Suppl. ): B12-B17. Umetsu, D. T., J. J. McIntire, O. Akbari, C. Macaubas, R. H. DeKruyff. 2002. Asthma: an epidemic of dysregulated immunity. Nat. Immunol. 3: 715-720. McKeever, T. M., S. A. Lewis, C. Smith, J. Collins, H. Heatlie, M. Frischer, R. Hubbard. 2002. Early exposure to infections and antibiotics and the incidence of allergic disease: a birth cohort study with the West Midlands General Practice Research Database. J. Allergy Clin. Immunol. 109: 43-50. Komai-Koma, M., L. Jones, G. S. Ogg, D. Xu, F. Y. Liew. 2004. TLR2 is expressed on activated T cells as a costimulatory receptor. Proc. Natl. Acad. Sci. USA 101: 3029-3034. Eisenbarth, S. C., D. A. Piggott, J. W. Huleatt, I. Visintin, C. A. Herrick, K. Bottomly. 2002. Lipopolysaccharide-enhanced, Toll-like receptor 4-dependent T helper cell type 2 responses to inhaled antigen. J. Exp. Med. 196: 1645-1651. Rodriguez, D., A. C. Keller, E. L. Faquim-Mauro, M. S. de Macedo, F. Q. Cunha, J. Lefort, B. B. Vargaftig, M. Russo. 2003. Bacterial lipopolysaccharide signaling through Toll-like receptor 4 suppresses asthma-like responses via nitric oxide synthase 2 activity. J. Immunol. 171: 1001-1008. Kline, J. N., T. J. Waldschmidt, T. R. Businga, J. E. Lemish, J. V. Weinstock, P. S. Thorne, A. M. Krieg. 1998. Cutting edge: modulation of airway inflammation by CpG oligodeoxynucleotides in a murine model of asthma. J. Immunol. 160: 2555-2559. Kline, J. N., K. Kitagaki, T. R. Businga, V. V. Jain. 2002. Treatment of established asthma in a murine model using CpG oligodeoxynucleotides. Am. J. Physiol. 283: L170-L179. Eder, W., W. Klimecki, L. Yu, E. von Mutius, J. Riedler, C. Braun-Fahrlander, D. Nowak, F. D. Martinez. 2004. Toll-like receptor 2 as a major gene for asthma in children of European farmers. J. Allergy Clin. Immunol. 113: 482-488. Chisholm, D., L. Libet, T. Hayashi, A. A. Horner. 2004. Airway peptidoglycan and immunostimulatory DNA exposures have divergent effects on the development of airway allergen hypersensitivities. J. Allergy Clin. Immunol. 113: 448-454. Redecke, V., H. Hacker, S. K. Datta, A. Fermin, P. M. Pitha, D. H. Broide, E. Raz. 2004. Cutting edge: activation of Toll-like receptor 2 induces a Th2 immune response and promotes experimental asthma. J. Immunol. 172: 2739-2743. Akdis, C. A., F. Kussebi, B. Pulendran, M. Akdis, R. P. Lauener, C. B. Schmidt-Weber, S. Klunker, G. Isitmangil, N. Hansjee, T. A. Wynn, et al 2003. Inhibition of T helper 2-type responses, IgE production and eosinophilia by synthetic lipopeptides. Eur. J. Immunol. 33: 2717-2726. Henderson, W. R., Jr, J. Lu, K. M. Poole, G. N. Dietsch, E. Y. Chi. 2000. Recombinant human platelet-activating factor-acetylhydrolase inhibits airway inflammation and hyperreactivity in mouse asthma model. J. Immunol. 164: 3360-3367. Hamelmann, E., J. Schwarze, K. Takeda, A. Oshiba, G. L. Larsen, C. G. Irvin, E. W. Gelfand. 1997. Noninvasive measurement of airway responsiveness in allergic mice using barometric plethysmography. Am. J. Respir. Crit. Care Med. 156: 766-775. Inaba, K., M. Inaba, N. Romani, H. Aya, M. Deguchi, S. Ikehara, S. Muramatsu, R. Steinman. 1992. Generation of large numbers of dendritic cells from mouse bone marrow cultures supplemented with granulocyte/macrophage colony-stimulating factor. J. Exp. Med. 176: 1693-1702. Sweet, M. J., B. P. Leung, D. Kang, M. Sogaard, K. Schulz, V. Trajkovic, C. C. Campbell, D. Xu, F. Y. Liew. 2001. A novel pathway regulating lipopolysaccharide-induced shock by ST2/T1 via inhibition of Toll-like receptor 4 expression. J. Immunol. 166: 6633-6639. Openshaw, P., E. Murphy, N. Hosken, V. Maino, K. Davis, K. Murphy, A. O’Garra. 1995. Heterogeneity of intracellular cytokine synthesis at the single-cell level in polarized T helper 1 and T helper 2 populations. J. Exp. Med. 182: 1357-1367. Liu, H., B. Hu, D. Xu, F. Y. Liew. 2003. CD4+CD25+ regulatory T cells cure murine colitis: the role of IL-10, TGF-β, and CTLA4. J. Immunol. 171: 5012-5017. Bryan, S., M. J. Leckie, J. Khan, T. Thansel, P. J. Barnes, B. O’Connor, V. Kanabar, S. Matti, S. Tholgate, S. J. Warrington, et al 2000. Effects of recombinant human interleukin-12 on eosinophils, airway hyper-responsiveness, and the late asthmatic response. Lancet 356: 2149-2153. Hofstra, C. L., I. Van Ark, G. Hofman, M. Kool, F. P. Nijkamp, A. J. Van Oosterhout. 1998. Prevention of Th2-like cell responses by coadministration of IL-12 and IL-18 is associated with inhibition of antigen-induced airway hyperresponsiveness, eosinophilia, and serum IgE levels. J. Immunol. 161: 5054-5060. Wynn, T. A., A. Reynolds, S. James, A. W. Cheever, P. Caspar, S. Hieny, D. Jankovic, M. Strand, A. Sher. 1996. IL-12 enhances vaccine-induced immunity to schistosomes by augmenting both humoral and cell-mediated immune responses against the parasite. J. Immunol. 157: 4068-4078. Takaoka, A., Y. Tanaka, T. Tsuji, T. Jinushi, A. Hoshino, Y. Asakura, Y. Mita, K. Watanabe, S. Nakaike, Y. Togashi, et al 2001. A critical role for mouse CXC chemokine(s) in pulmonary neutrophilia during Th type 1-dependent airway inflammation. J. Immunol. 167: 2349-2353. Cui, J., S. Pazdziorko, J. S. Miyashiro, P. Thakker, J. W. Pelker, C. DeClercq, A. Jiao, J. Gunn, L. Mason, J. P. Leonard. 2005. TH1-mediated airway hyperresponsiveness independent of neutrophilic inflammation. J. Allergy Clin. Immunol. 115: 309-315. Thoma-Uszynski, S., S. M. Kiertscher, M. T. Ochoa, D. A. Bouis, M. V. Norgard, K. Miyake, P. J. Godowski, M. D. Roth, R. L. Modlin. 2000. Activation of Toll-like receptor 2 on human dendritic cells triggers induction of IL-12, but not IL-10. J. Immunol. 165: 3804-3810. Sieling, P. A., W. Chung, B. T. Duong, P. J. Godowski, R. L. Modlin. 2003. Toll-like receptor 2 ligands as adjuvants for human Th1 responses. J. Immunol. 170: 194-200. Revets, H., G. Pynaert, J. Grooten, P. De Baetselier. 2005. Lipoprotein I, a TLR2/4 ligand modulates Th2-driven allergic immune responses. J. Immunol. 174: 1097-1103. Velasco, G., M. Campo, O. J. Manrique, A. Bellou, H. He, R. S. S. Arestides, B. Schaub, D. L. Perkins, P. W. Finn. 2005. Toll-like receptor 4 or 2 agonists decrease allergic inflammation. Am. J. Respir. Cell Mol. Biol. 32: 218-224. Hirano, T., C. Hom, Z. Ovary, K. Hanashiro, Y. Tokeshi, T. Nakasone, M. Sunagawa, M. Nakamura, T. Kosugi. 1983. Half-life of murine IgE antibodies in the mouse: azelastine and suplatast shorten the distribution half-life of IgE in rats. Int. Arch. Allergy Appl. Immunol. 71: 182-184. Hanashiro, K., Y. Tokeshi, T. Nakasone, M. Sunagawa, M. Nakamura, T. Kosugi. 2002. Azelastine and suplatast shorten the distribution half-life of IgE in rats. Mediators Inflamm. 11: 61-64. Xu, D., H. Liu, M. Komai-Koma. 2004. Direct and indirect role of Toll-like receptors in T cell mediated immunity. Cell. Mol. Immunol. 1: 239-246.